We're switching things up a bit on the first Thursday of every month. Why? Why not. And because it's incorporating TRACK workouts into our weekly open runs, which will make everyone faster and hopefully add a little something extra to your training schedule. Once we arrive at ERPT, we'll do a couple quick activations to finish warming up and jump right into the workout. Workouts will vary depending on upcoming races, training, or just whatever we're trying to accomplish. After finishing the workout, we'll run as a group back to the store. The total distance of Thursday Track Night workouts will vary, but expect it to be anywhere between 6-8 miles in total, including warm-up & cool-down. What if you don't have experience with track workouts? ALL GOOD. We're here to answer any questions you might have and scream at you to push it along the way. (If you REALLY don't have any experience with tracks, they're giant circles, which means you can't get away from us or our encouragement.) So experienced or not, join us. Click here to view this route on MapMyRun. NOTE: the midpoint of this 3 mile route is East River Park Track. This Thursday's session is a TRACK WORKOUT at East River Park Track. We're still meeting at the Under Armour Brand House on Broadway between Houston & Prince; then, we'll warm-up with an easy 1.5 mile run to the track, bang out the below workout, and then return to the Under Armour Brand House with an easy 1.5 mile cool-down back. TOTAL RUN DISTANCE: 6 miles. Resident Runners is HYPE to announce a new weekly addition to our running schedule. We'll be hitting East River Park Track every Tuesday morning at 8am for some speed work. So wake up, lace up, have some coffee, and let's get it. Questions? 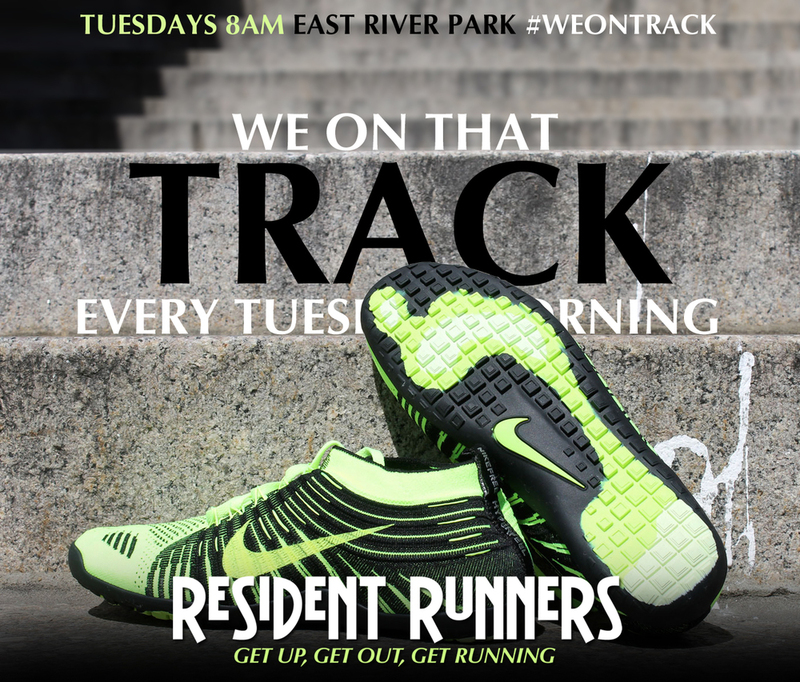 Hit @residentrunners @djroot456 @raymondhproject using #weontrack or shoot an email to residentrunners@gmail.com.